Greetings Blog Readers! For the last couple of weeks, we have been reading The 5 Love Languages for Men, written by Dr. Gary Chapman, PhD., author of The 5 Love Languages series. This book is sort of a "how to" guide for men to teach them how and why they need to speak the "Love Language" of their female significant other. The lessons go well beyond that, however, in that you can really use the lessons learned here to more effectively communicate with everyone in your life-From friends and family to business associates. The Five Love Languages for Men can be purchased in a variety of formats, and for this review we had a paperback copy. This book is designed for the men, so I enlisted the help of my special guy. I will turn this review over to him now! Enjoy! From Matt, AKA "Special Guy"
To my surprise, a week later, a book arrives with the title “The 5 Love Languages for Men”. Almost immediately, I perform the single number one no-no of picking a book… yes, I looked at the cover. On the back, the book boasted “sold 10 MILLION COPIES” and immediately, with a chuckle, my sarcastic mind thinks “yes, bought by wives for husbands who hull walnuts with their foreheads… of which, I am apparently one”. True to my word, however, I opened the book and started reading. Now, before we go any further, it is important that you keep in mind one simple fact. Picking up a book to read, even from preferred genre such as science fiction or fantasy, puts me to sleep better than a glass of warm milk before bedtime. I find reading to be a very relaxing way to wind down before bed. As with all books, I started out with Chapter 1. How many languages do I speak? As presented in what I consider to be very simplistic format, there are five languages or methods of communication. Ok, this is sort of makes sense to me. Starting in Chapter 2, let’s learn about Love Language #1 - Words of Affirmation. I certainly would not have imagined that I would begin to legitimately question, do I have an issue with communication? I often enjoy injecting humor and sarcasm into conversations; however, while I can appreciate my comments simply as humor, perhaps these comments are not coming across as the “supportive humor” I intend. Now we continue on to Chapter 3 – Quality Time. To me, this chapter seems to make the most sense. Actually paying attention to each other could be anything from talking about your day to playing a game together, providing that you are NOT multi-tasking, but are actually paying attention to one another. Could it be that this is my preferred love language? Now I’ve made my way on to Chapter 4 – Becoming Fluent in Gift Giving. At first, this chapter struck me as a materialistic method of communication, but as I kept reading, I came to learn that gift giving could be something as simple as “Hey, you go hang out with the girls this Friday night, and the babysitting is on me”. Once again, it’s sort of common sense to me that you don’t give somebody the gift of a custom bowling ball drilled to fit your fingers. Chapter 5 – Acts of Service, I felt was another common sense chapter. The other day, my fiancé was sick, and did not feel like dragging out of bed, so I fixed her breakfast and brought it to her. In my mind, this was a help to her, but until I read the simplistic breakdown of acts such as these, I did not realize how many other positive messages this simple act was giving to her. Chapter 6 – Becoming Fluent in Physical Touch felt almost like an awkward chapter to me. I’m not what I would consider a “touchy-feely” person. To me, your space is your space and my space is my space. I’ve never had problems shaking hands, but I’m just not the type to sit around holding hands or snuggling. In my mind, the simple act of a six second shoulder massage or a quick hug is a big deal. I did not realize what a big deal I consider this to be when I receive such signs of affection from her and it made me stop and think about how I can communicate my appreciation to her. In closing, I’m not going to keep going on and on about each chapter in the book, but suffice it to say, it’s surprisingly eye opening and while I was surely one to think that I was a good communicator, perhaps I was not nearly as good as I thought I was. Ultimately, unless you have a storybook relationship in which you never fight or argue, this book is a MUST READ for anybody interested in improving their relationship. I hope you all enjoyed his review! I know I did! 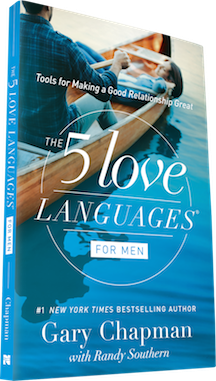 If you would like your very own copy of Dr. Chapman's book, "The Five Love Languages for Men" you have a chance to win one below! Just enter the giveaway, and if chosen, you will receive your copy in the mail! GOOD LUCK! This Give Away is Now over, Congratulations to the Winner! Kendra S.!